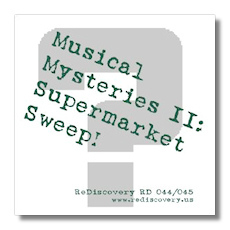 Classical Net Review - Musical Mysteries II - Supermarket Sweep! Once upon a time (the late 1950s and early 1960s, to be exact), classical music was no farther away than your local supermarket, as if it were a staple like bread and eggs. (You mean it's not?) Housewives, or perhaps their buttoned-down advertising agency executive husbands, could stop by the local A&P or Acme on a mission for canned peas and come out with a record containing a great masterwork or two. These were issued, usually one per week on rotation, as part of the Basic Library of the World's Greatest Music, or the Standard Treasury of the World's Great Music. One looked in vain for the names of the performers, however, and connoisseurs stuck their noses up at these recordings. How could something cheap and anonymous be any good? As grandparents and parents pass away or get put into nursing homes, what remains of the Basic Library or the Standard Treasury ends up on eBay (where it usually remains unbidden upon), at library sales, or in landfills. Fortunately, some people, like David Gideon of ReDiscovery, have not been so quick to dismiss these records. Many of them contain very good performances, actually. Over the past few years, there's even been an attempt to identify the hitherto anonymous performers. In other words, these "Musical Mysteries" have been solved. It should come as no surprise that no new readings actually were recorded for these series. Instead, older recordings were licensed for use. In the present case, all of the recordings once appeared on the Concert Hall label's Musical Masterpiece Series, where they were properly identified. Comparing the Concert Hall/MMS recordings to the Basic Library or Standard Treasury LPs has made the above identifications possible. This is hardly a shabby group of musicians! Noel Mewton-Wood (who also can be heard in previously anonymous performances of Tchaikovsky's and Chopin's First Piano Concertos on ReDiscovery RD 110/111/112/113) turns out to be something of a cult figure. This is not just because he was a very interesting pianist (his reading of the Schumann here is both exciting and majestic), but also because of his horrible death: following the death of his male lover (for which he blamed himself), he swallowed prussic acid. I could listen to this version of the Schumann Concerto any day and be happy. Technically, the orchestra's performance is not overly polished, but dang it, Schumann's passionate and proud soul has been brought back intact by everyone involved! Rheims-born pianist Philippe Entremont is still with us. He must have been still in his twenties when he taped Franck's fetching Symphonic Variations, and as with Mewton-Wood's Schumann, what the reading lacks in polish it gains in excitement and stylistic know-how, particularly from Entremont. I particularly enjoyed the "Polovtsian Dances." This is a piquant reading that misses nothing of the score's drive and color. More to the point, my father had this particular performance in his LP collection during the 1960s. (Oddly, we owned but a single volume of the Basic Library.) I literally grew up listening to Hupperts and his band from Utrecht doing justice to Borodin. Borodin and Rimsky-Korsakoff go together like sour cream and herring. Walter Goehr's Schéhérazade puts a smile on one's face, not because it is perfect, but because it has such a winning personality. This work is full of solos for the wind instruments, and the Dutch musicians consistently execute them with character. No one can call this performance generic. One can find many better-played alternatives, but that's no guarantee that boredom won't set it. The Mendelssohn is a more rocky affair, but that's the Scottish coastline for you. Overall, these performances sound as if they were recorded quickly, albeit by talented musicians who had the physical skill, the intellectual ability, and the emotional commitment to make the music work. And work it does. This will be a very worthwhile trip down Memory Lane for those of us over, say, 40. These performances are in very tolerable monaural sound, except for the last two items, which are in genuine stereo, thanks to the availability of tapes. In fact, the Borodin sounds excellent, not least for the floor-shaking bass drum in the second Polovtsian Dance. Elsewhere, there are momentary dropouts, as well as unsteady pitch and distortion, but there's nothing you can't listen around. This pair of CD-Rs is available for $15 (including shipping) from www.rediscovery.us.